Have a look on the dashboard on the OMS when you log on - there is a link to the Map Explorer BETA version. 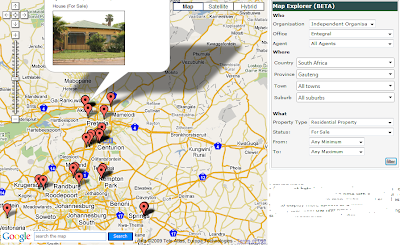 The Map Explorer (or GIS explorer as we previously referred to), allows you to plot all your listings on a Google Map. What's more is that you can filter on the area, property type, price or agent (and office for our national clients). Clicking on a marker will open op a bubble window with short property details including photo. There is also a hyperlink to open up the listing. This way you can easily view the listing, or, if the market is not on the property, adjust the precise location of the property on the map through the property location function.